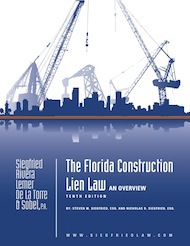 The Florida Construction Lien Law is a statutory device which enables lienors, particularly those who do not have a contract directly with the owner, to protect their rights to payment for work performed on a project. The Construction Lien Law, found in Chapter 713 of the Florida Statutes, provides lienors with the right to look to the improved property as security to ensure payment. A secondary purpose is to protect an owner from liens against its property. The Florida Construction Lien Law is complex, and the consequences of not complying with its provisions can be dire. Through this series of blog articles, my colleague Nicholas Siegfried and I will address issues both common and unusual in an attempt to clarify what is otherwise considered by some to be a confusing statute. We begin this series by focusing on the Notice of Commencement, which is a “notice” that the owner is required to record, pursuant to the lien law. The purpose of the Notice of Commencement is to provide the lienor with the current names and addresses of the owner and contractor, so that the lienor could properly mail a Notice to Owner. It also may control the date the lien attaches. A properly recorded lien relates back to the date the Notice of Commencement was recorded and may affect the priority of intervening interests. The Notice of Commencement provides lienors with valuable information in order for a lienor to comply with the Lien Law. Information which must be in the Notice of Commencement includes: 1) a description of the property; 2) a general description of the improvement; 3) the name and address of the owner and contractor; 4) the name and address of the surety or lender, as applicable; and 5) the expiration date. An owner who fails to record a Notice of Commencement does so at its own peril, as they may not be aware of all prospective lienors who have served Notices to Owner. Although the failure to serve a Notice to Owner does not excuse a prospective lienor from serving a Notice to Owner on the owner, they may not be required to serve a Notice to Owner on the contractor. A Notice of Commencement is void if the construction of the improvement is not begun in ninety days. Furthermore, in order for liens to “relate back” to a Notice of Commencement it must be re-recorded after the first year. An owner/developer needs to understand the purpose and requirements of a Notice to Owner prior to beginning their project, and a lienor should always obtain a copy of the Notice of Commencement prior to commencing construction. Our construction law attorneys are available for consultations regarding any questions pertaining to Notices of Commencement.